As ever everyone is welcome to come along to meet us! Flushed with the highs of our recent tour in Portugal we today were entertained by friends at Judd St Tigers who play at Winchmore Hill Ground in Ford’s Grove. We shall play that venue more times this season. They go to play at Oporto Cricket and Lawn Tennis Club next weekend. Before I press on further I would like to highlight long time Grace – Nick Swinburne, who sponsored today’s Matchball. Thank You. Unusually Skipper Mahender lost the toss but we were put to bat which was desired anyway. We had two new to side players today and as Judd St were short we agreed to loan out (Tour Fifer) Sam and Chair Jonathan. Ansar opening alongside (Centenerian) Scott was most unfortunate. First ball wide then as he connected next ball his bat broke and the resulting shot flew for easy catch by Sam of all people. In next was Mendis facing Ali S bowling. Ali struggled physically a lot today with hamstring and would only bowl three overs and later looked certain when batting to need a runner after another episode. Leading the charge other end was Mitch G and he induced Scott into a deep gully shot safely captured by M Webster for 3. Next time Mitch was out with really low bounces he got Mahender LBW before he could settle. Chris Wright was now a new bowler from over 7 and ceded the first boundary of match by Mendis who had been dropped in the previous over. It was Mendis who also fell LBW after 9 to Mitch for his third wicket just after Chris was being slaughtered by Dom who took 15 in an over. He too though was LBW to Chris for 20. Stuart lingered for a while but was caught and bowled by Chris and Manish was soon out for little after a drive to awaiting Mitch at Mid On and two balls later an almost carbon copy shot took Newton for 9. Before this, young player Hari had started a spell of bowling and Newton was emphatic in a boundary. The boy did not have much pace but the ball was always in the slot and challenging. 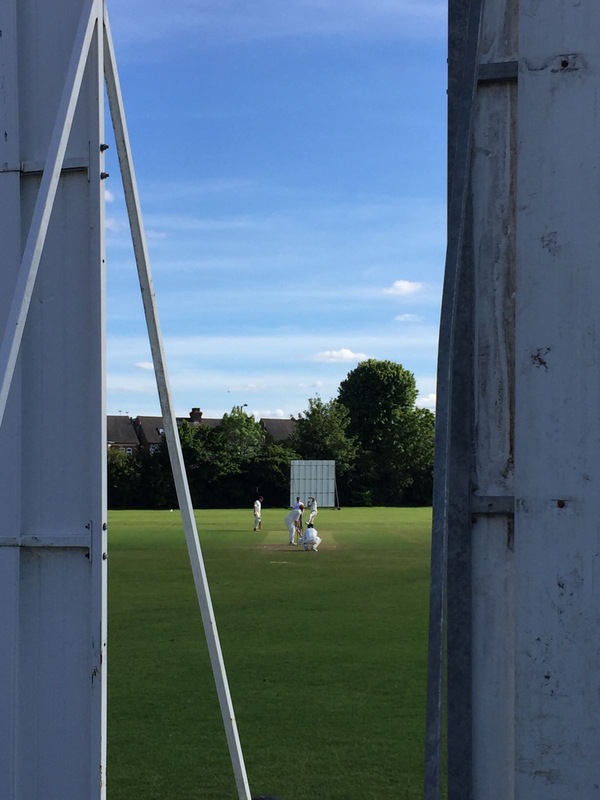 We had considered getting drinks ready for over 20 but at 64 – 8 in only 15 overs would the innings end sooner? Leo carved two boundaries in the 17th to calm down Chris who ended on 6-0-38-4 then being faced with latest bowler Steve Bignell who had an aerial bomb style had a trademark 6 well over straight hit and perhaps drinks were likely. Mamun had parried many shots then sent an emphatic boundary off Hari but was undone next ball as the ball found his stumps. Drinks then while two balls into the 20th at a mere 89. Could we actually reach 3 figures? On resumption, new player Ronnie to crease then played to keep Leo on strike who brought our score up to 100 with another two past the markers. Hari’s father, Jason, was bowling and both Sam and Jonathan made returns that created dot balls but on the fifth delivery it was all over as he got through to cap Leo at a majestic 30 with Ronnie not out on two and a target of 101 set. Tea was ready in good time and a good varied selection without sandwiches and our prospects did not seem bright at all. M Webster and Captain Richard Burgess were the openers facing Newton and Manish who both opened with Maidens and then Captain fell LBW for 2 to Newton. Hardly any more score before Manish had an instinctive caught and bowled to take Webster for 1 in a Wicket Maiden leaving Guest player Sam on 3. Score now 8 for 2 in 8, followed by 9-2-9. The 29th was interesting as before then it was amusing to see the open and closed field positions dependent who was on strike. This was a first, and only over, from Ronnie. Ansar was also now bowling, maiden to start, but in place for Ali to reach 50 in 50 off a boundary (62 mins) then going onto two more Maiden and a finish on 5-3-9-0. Back to Ronnie, yielding another single to Sam then taking the big prize of Ali who drove to waiting hands of Ansar at Extra Cover and capping him at 51. Replacement Jonners meant we now had 13 Graces on Field, only punished as Jonners swept boundary second ball. 22 required in 11 overs, time for Graces to squeeze tightly once more. Jonners did not help with his 11 before Mendis bowled him after no customary nurdles but bold second boundary and a brace. After all the tight bowling, Mahender taking Mitch for 1 despite his previous shot having two players headed to catch before mid on, looking into the sun and almost colliding and then seeing ball now on deck; there were 23 balls remaining and still only 13 required. Then 18 left to score 11. On the last ball from Mendis, Sam charged up the wicket but Chris was staying put and was effectively ran out and did walk for his 12. A chance for wicket keeper Ian Duffern to help get 11 from 12 balls and the pair survived Mahender so that the last over loomed with 7 required. Mahender had finished another match on 22-1 in 5 or 6 overs. Ian had kept strike and was bowled first ball then Chris perished for 5 as Newton caught and bowled holding a fierce response well. Young Hari was not keen to run but Father Jason had set off and he became stranded. Three balls left and as Jason had crossed he faced the ball rather than last man Steve Bignell. 7 required off 3 balls, a dot ball and then Newton finished it all off bowling him. An absolutely incredible finish that saw 4 wickets crash in that over from Newton with no added score (7.5-2?-10-4) and a win by 6 runs for Graces after all with one ball to spare. TV rights are now on offer. A frustrating early partnership of 67, Sam and his 2 hour stint at Crease, Ali with 2 x 6 and 6 x 4 in 51 could have meant an early finish and embarrassing loss but our bowling team and Scott as keeper held firm . Manish had gone on to only yield 11 in 8 and Mamun was 4-2-7-0. Mendis was 8-1-29-1 and Ronnie only 1-0-5-1. The field saved the day although that steadying tally of 30 from Leo to join Dom (20) as only double digit batters meant Leo was our Man of the Match. You could argue second place was highly competitive but does not need any note so all round efforts recognised. On to Alleyns Ad Hoc at Herne Hill next week. To be a good match for sure but today will linger in memory for a long time to come. Fortunately we have known Judd St Tigers a long time and they were pleased that this was no walkover but an exciting match against all probability so it was drinks at the bar and good company to finish a truly bright day.